Old tires are normally thrown out or at the very least end up sitting around in the garage or yard collecting dust. 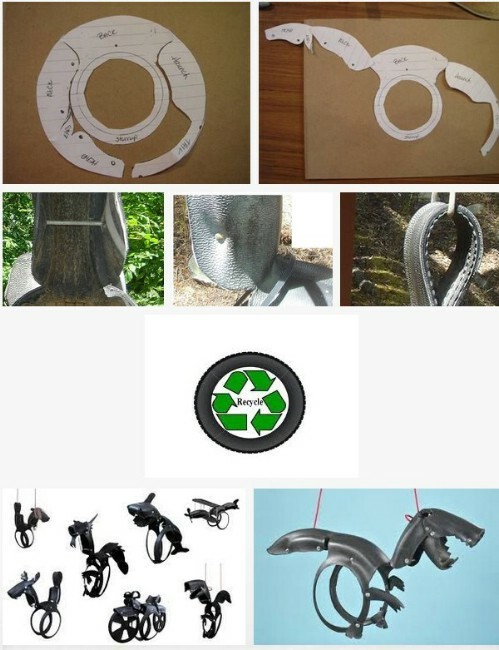 Instead of throwing them out or letting them sit there making your yard look cluttered, you can now recycle old car tires into something useful? 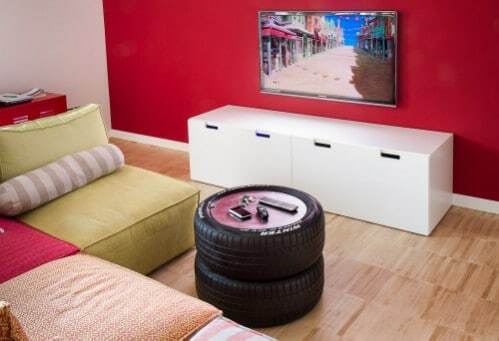 Whether you have one or one hundred tires, there is always something that you can make with them that will not only repurpose them but give you great interior and exterior décor. 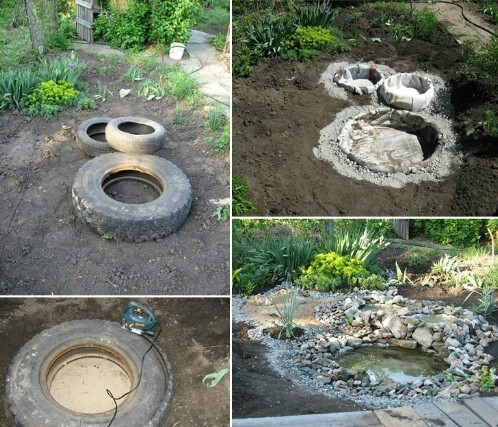 You can turn those old useless tires into everything from furniture to flower pots to something for the kids. Rubber is very durable and soft because of its elasticity and it is very easy to work with in terms of crafts and DIY projects. 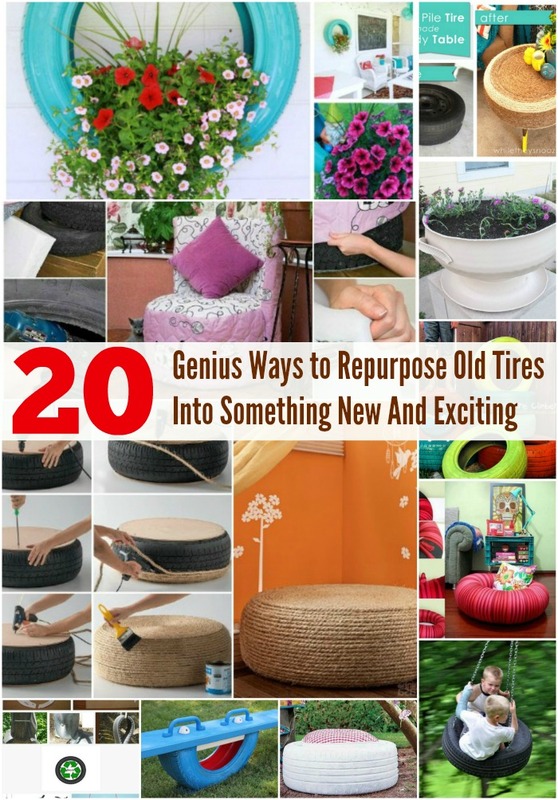 The next time you have your tires changed, ask to keep them then take a look at the 20 different ways we have for you to recycle old tires into something new and exciting. If you have kids or grandkids, you know that outside play equipment can be very costly. Instead of investing a few hundred dollars in a jungle gym of sorts, you can now recycle old car tires into a great tire climber and kill two birds with one stone? Just paint the tires bright colors and stack them up however you want to create the climber. You will need to bolt them together to make them safe but it takes very little time and this is something that you can create for free if you already have tires and paint on hand. 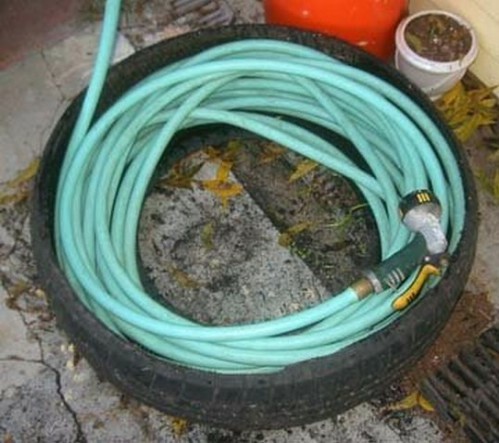 Instead of leaving that garden hose out where it can become damaged (and let’s face it, it just looks cluttered when you don’t have your garden hose put away), you can make a hose caddy out of an old tire. You just have to cut the tire in half and then coil the hose up inside it. If you really want to make your outdoors look neat and tidy, paint the tire after you cut it so that it matches your garden shed, home exterior or your outdoor décor. You can then hang the hose up or just hide it away on the ground, whatever you choose. 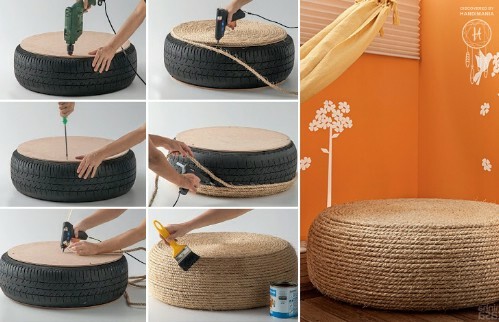 Make actual indoor furniture with old tires? Yes, we think so and this rope ottoman is the perfect weekend project if you are in need of something new and exciting for inside the house. You will need a round board of some sort to create the top and then you basically just add the rope to cover the entire thing. It makes a beautifully rustic looking ottoman that is perfect for indoor use or you could add it to your outdoor décor as well if you want. It’s quite easy to do and takes very few materials. 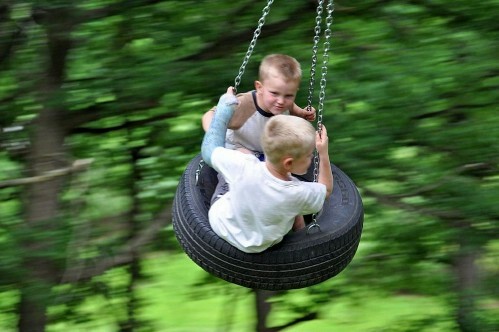 You can turn old useless tires into wonderful swings and not those that you had when you were a child. Your little one will adore a horse swing that you can easily make from an old tire and a few other key supplies. This little project takes much less time than you would imagine and it produces an adorable horse swing, much like those that you see at farming stores but a lot cheaper. You just have to create the pattern, cut out the tire and then add the mane and a rope for hanging. 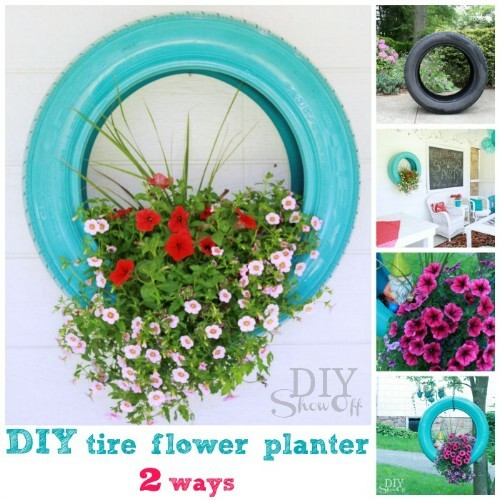 There are a couple of ways that you can create planters from tires and this one gives the tire a flowered look. There is some cutting involved and you may want to paint the tire to give it a great color. You could make several of these depending on how many tires you have on hand and completely decorate your outdoor deck, porch or garden area. They are relatively easy to make and only require a tire and some paint. You could also do different sizes with different sizes of tires so keep all of those old tires to create a beautiful garden with your DIY tire planters. With an old tire, some rope and a few pieces of wood for the legs, you can make a wonderful table that you could display indoors or out. You’ll want a piece or two of plywood that you can cut in a round shape to fit the top and bottom (this is what the legs will attach to) and then some rope to cover it up. You could paint the rope beforehand if you wanted something more colorful or just use rope color to give it a great rustic look. You can make the legs out of plywood as well so there are very few supplies needed and this is a rather quick project, too. 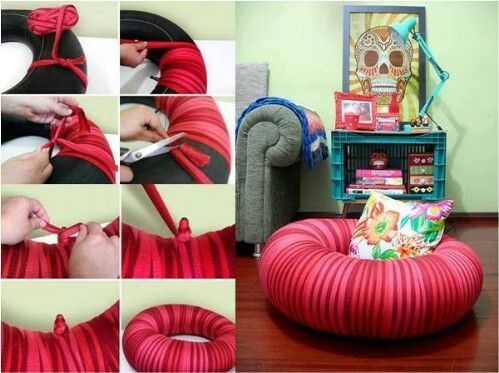 You can use an old inner tube (like the ones you used at the lake when you were a kid) to create a beautiful and really comfortable tube seat. You simply have to blow up the tube (repair any holes that it may have as well) and then cover it with ribbon or fabric. Little ones will love sitting on these in front of the TV or they make great chairs for teenagers’ rooms. You can do them in as many colors as you want and if you have a couple, you can create a great little seating area for the kids. You know, like a teeter totter only with a tire! You can easily make this adorable little teeter totter for the kids and you only need one tire, a board and a few decorating supplies. The tire is cut in half so you can make two if you need them. 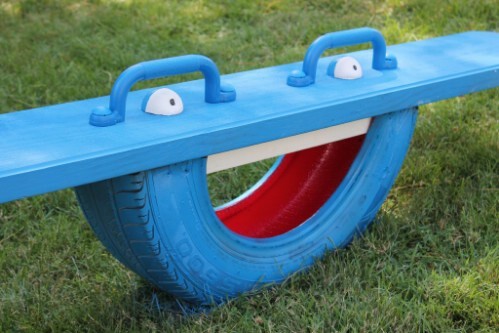 Paint the tire and the board in the same color or really make it cute by doing different colors. The board serves as the seating area and you will need to add the handles and then decorate it to look however you want. These are really great for toddlers because they are close to the ground, unlike those teeter totters at the park. If you have really been wanting a garden pond but those kits just seem a bit expensive, use those old tires to create a beautiful pond that will cost you very little. Aside from the tire (or multiple tires if you want to create a graduated pond) you will need garden foil, gravel or pebbles, sand and a few plants and other supplies that you may have already or you can pick up at your local gardening center. This is a really easy way to have that relaxing garden pond without spending a fortune and you can build it in a weekend. What better way to thrill the kids this summer than with their very own sand box? 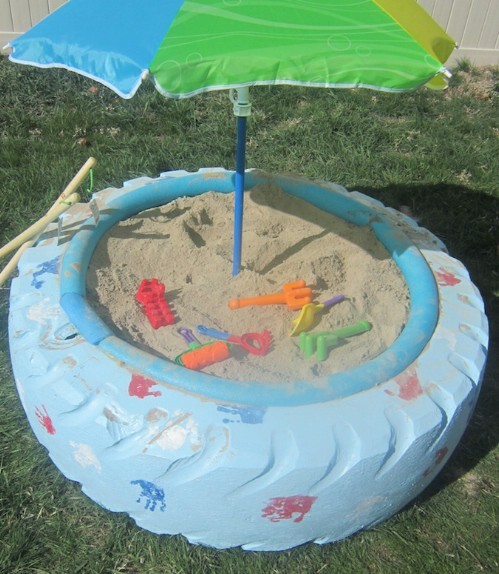 You can make a great sandbox out of a tire and if you have a few tires on hand, make a couple of them and put them together for a really neat sand area. Tractor tires work best if you have them because they are a bit larger than car and truck tires. You just paint the tire and then add the sand. This is one of the easiest projects and something that will literally take less than a day to make. 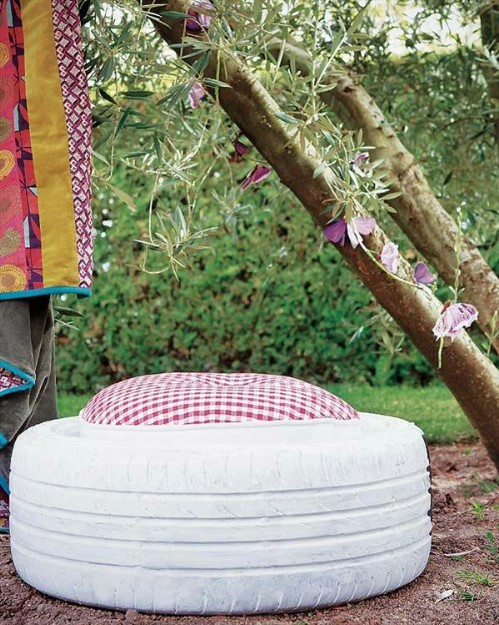 Take that old tire, add a little paint and some cushioning and you have the perfect stool chair for outdoors. You just have to create a cushioned center and these are great for decks or around a fire pit. You will need a round board (you can cut one from plywood) for the center and then you just add the cushioning to the top of the board. Do these in multiple colors to brighten up your outdoor seating areas or in the same color to really make your outdoor living spaces look organized and elegant. You will need two tires to create this lovely chair as well as a wood palette, sponge for filling and a bit of fabric to cover it. 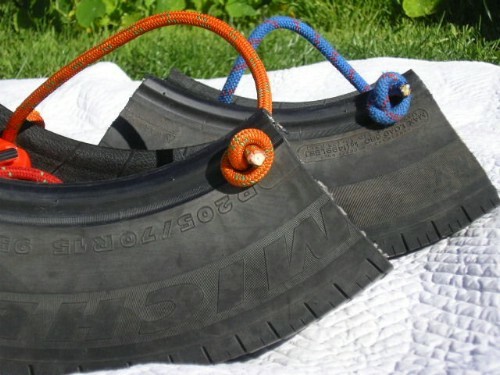 You can make these in different sizes depending on the tires that you have available. 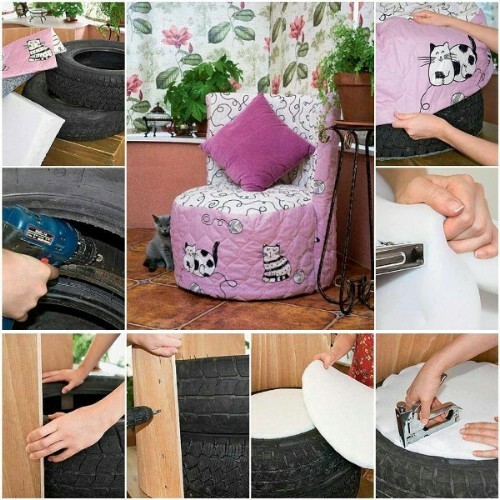 If you want to create a child’s chair for instance, use small tires or you can use larger tires and have it sitting in your living room or bedroom. Cover it with whatever fabric you want that matches your current décor. It’s really easy to make and great for any indoor sitting area. 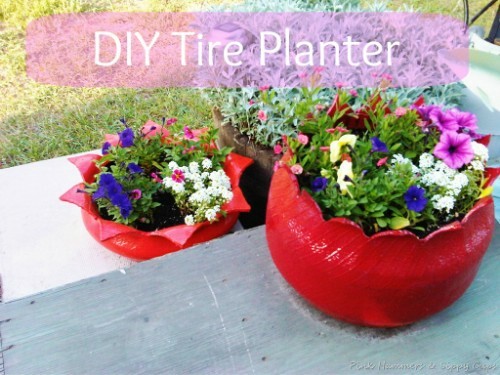 There are a few ways that you can create planters from old tires. This hanging tire planter is one of the easiest and takes only about an hour or so to complete. You just have to paint the tire (whatever color you prefer) and then drill holes in the bottom to allow water to drain. Then just plant whatever flowers you want in the bottom and hang it from a chain or rope. These work really well with smaller tires or if you have a big enough tree, you could do a really large one and fill it with different types of flowers. 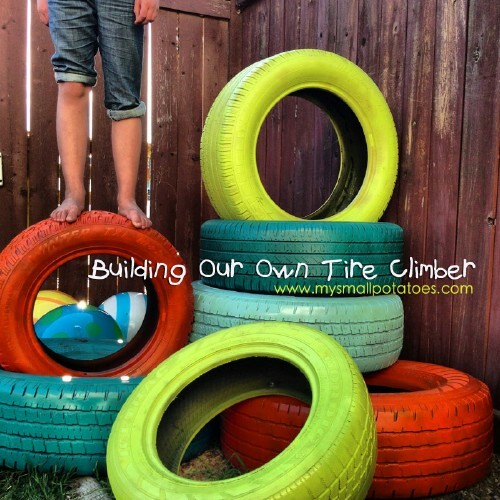 If you have a little one who loves the swing set but doesn’t really like the traditional way of climbing onto the slide, you can create a really cute ladder from old tires that your little ones are sure to love climbing. You just have to choose tires of the same size and you can paint them to match the swing set or leave them plain, just whatever you prefer. 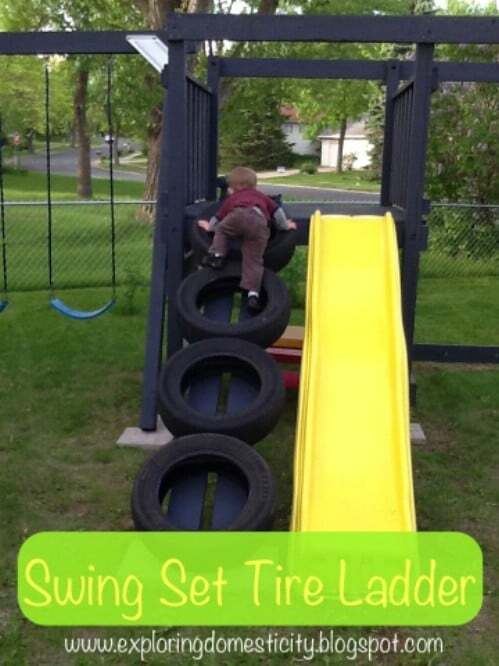 Kids of all ages are sure to love climbing to the top of the slide on their tire ladder and this is a project that will take you only a couple of hours or so, depending on whether or not you want to paint the tires first. If you really want to thrill your kids, build them an old tire swing like the one you had when you were younger, only with a little twist. Instead of simply hanging the tire, consider painting it first. Or, if you have a couple of tires then you can create an entire swing set out of painted tires and hang them in various trees around your yard. However you do it, having an old fashioned tire swing in your yard is sure to give the kids and grandkids a thrill this summer. A trug or garden basket is easy to create from old tires and since you only need a little piece of the rubber, you can make these from the leftover pieces of other projects. You just have to add a handle or a way of carrying it and these make the perfect baskets for the garden. Water and soil won’t hurt the rubber so they are very durable and they are so easy to make that you can turn out a couple in about an hour or so. 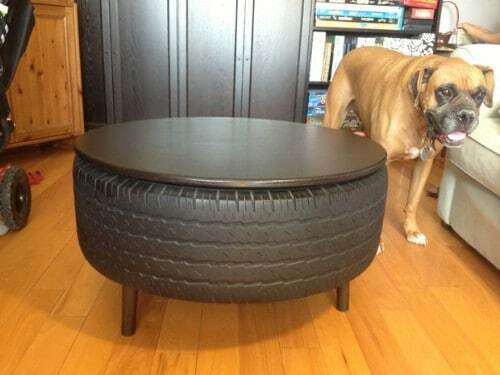 A couple of tires and something for the top and you can create the perfect coffee table for your garage or man cave. You may want to shine the tires up a bit before you put them together and you can make the top out of a number of different materials. Note that the instructions on this one aren’t in English so you’ll want to use Google translate when you visit the site for the how-to. This is a really easy project though and one that is sure to impress anyone who visits your men only areas. Turning a tire inside out may seem difficult but it’s much easier than you think. Once you have done that, you can use part of the tire, the rim and a few cinder blocks to create stunning columns in front of your house. You will need a tire for each column that you want to build as well as the blocks or you could use another material in place of cinder blocks if you want. 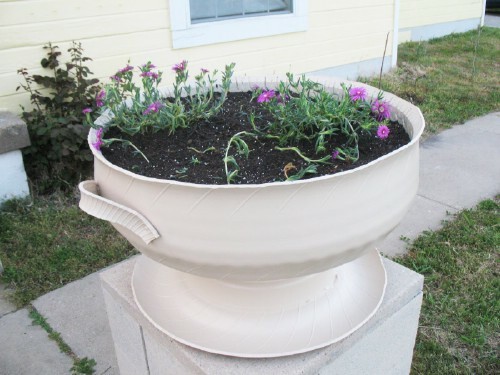 With their handles and on their pedestals, these great tire planters look really expensive. Only you will know that they are made from old tires. This is one of the simplest projects that you can do with old tires and only requires a tire, a round piece of board and a few legs. 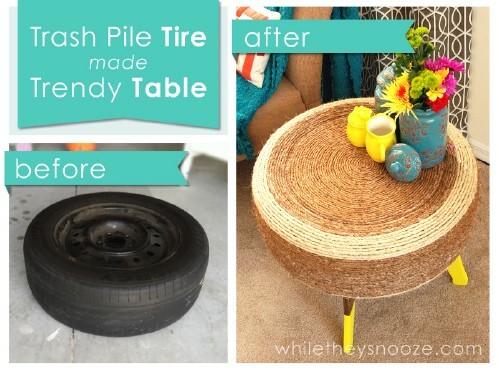 You just clean up (or paint) that old tire, add a round board for the top and then add some legs. What could possibly be easier? And, this is a great coffee table for man caves or garages or you could use it in the living room if you wanted. It’s durable because of the rubber and you won’t have to worry about the puppies chewing it up. You could also add a glass top if you wanted to make it a bit more elegant. 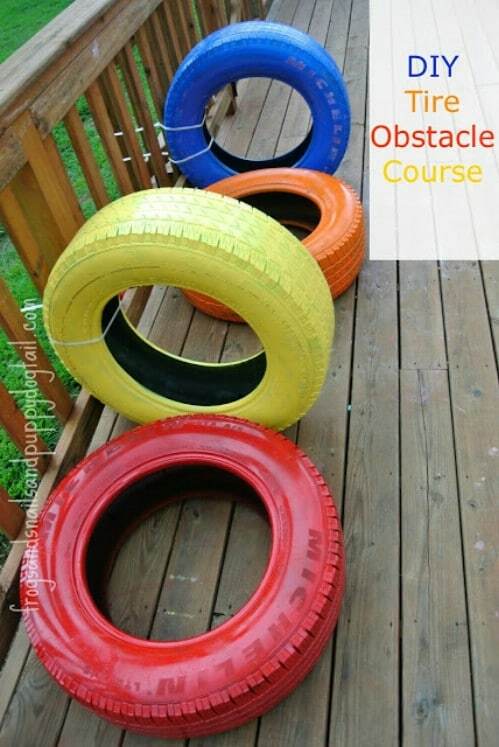 Put your old tires to use and give the kids a great play area at the same time by building a tire obstacle course. You can do this with any number of tires so choose how big you want the course beforehand and you’ll know how many tires you need. Paint the tires first and then make sure that you affix them to the deck, porch or wherever you are putting the course so that it’s safe when little ones run through. You can make it so that they crawl through, climb or jump over the tires.